Are you looking for the best travel system of 2019? If yes, then you may want to hear my story. I spent over $600 on travel system and guess what? After 1 month of use, the frame broke. The brand (let’s skip its name) wasn’t happy to exchange my stroller. So here I was, tired after (too) many sleepless nights with 1-month-old baby, looking for a new stroller. This is how I created this list of Best Travel Systems for 2019. I hope it will help you to avoid such problems. What To Love About Travel Systems? 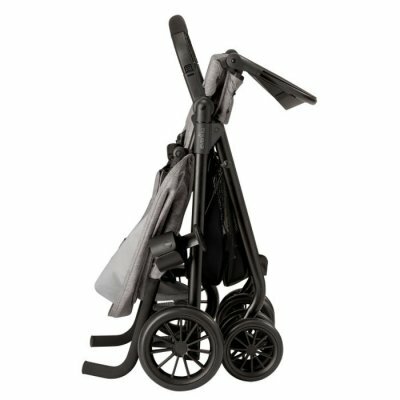 Is Travel System Worth Buying? Psst! You don’t want to spend a fortune on a stroller? Skip to my ranking of the best affordable travel systems! I picked brand new models as well as strollers that have been second to none for several years. My absolute favorite among travel systems is UPPAbaby VISTA Travel System with MESA infant car seat. 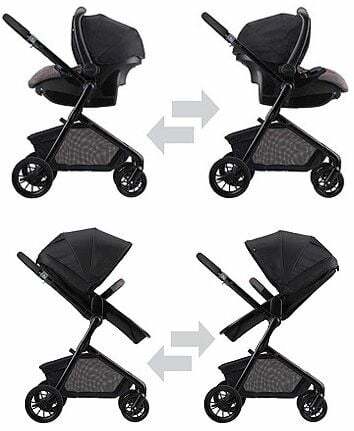 This is a top-quality travel system and it looks so stylish and chic! I love VISTA for its versatility and multi-functionality. Did you know that UPPAbaby VISTA can be used for two or even three kids? How awesome is this?! The stroller itself has large amount of useful features that make it a high-quality buggy. There are rubber, foam-filled wheels and all-wheel suspension which together provide really nice and smooth ride. Although VISTA is an everyday stroller for city use, it also handles rougher terrain really well. The seat is very comfy with soft padding, one-hand recline and adjustable 5-point restrain. 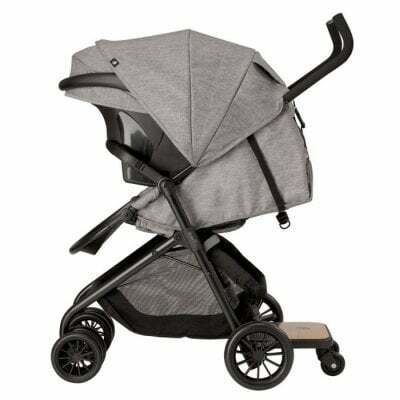 Oversized canopy has pop-out sun visor which is made of special fabric that protects baby from harmful sun rays (UPF 50+). VISTA is convenient to push with one hand for short, average and tall parents thanks to telescoping extendable handlebar. This stroller has also enormous basket under the seat with maximum capacity of 30 lbs. It is the biggest capacity on the market!! Seriously, you won’t find another stroller with such a big storage space. This basket can accommodate ALL baby gear and there still will be space for your shopping bags! Now, a few words about MESA infant car seat that is included in this travel system. It comes with a quick to install car seat base that is equipped with an indicator that informs whether the base is installed properly. It’s one of the reasons why MESA has been awarded by NHTSA. It’s a top rated car seat in terms of ease of use. Other awesome feature include side impact protection, adjustable headrest that supports baby’s head, breathable fabric with moisture-wicking function and no-rethread harness that easily adjust as the baby gets older and bigger. UPPAbaby VISTA Travel System is pretty expensive so it doesn’t have as many customer reviews as the budget strollers, but it gets lots of compliments! Here are the major advantages and disadvantages mentioned by parents in online reviews. As a single stroller VISTA has more reviews at Amazon. You can read them here. If you want to use UPPAbaby VISTA with a different infant car seat than MESA, you will need to purchase a special adapter. It is expensive, but you can be sure this is top-notch stroller and will give your baby maximum comfort and safety. 1. This is all-in-one stroller that grows with the baby and EXPANDS for second and third child, so you won’t need to buy another strollers when your family gets bigger. 2. It’s high-quality and made of durable materials so it will serve you for YEARS. 3. Thanks to comfortable, safe seat and smooth, bumpless ride your little bundle of joy will have a pleasant stroll and avoid spine disorders. To check the travel system stroller current price and available colors I recommend you to visit Amazon. If you want to find out more about this stroller you can read my full review of UPPAbaby VISTA with detailed comparison of 2019, 2018 and 2017 models. This travel system is a compilation of a new B-Lively Stroller and B-Safe 35 Infant Car Seat. Main highlights of the new version of the stroller are upgraded canopy, larger storage basket and added footwell for the little passenger. lightweight construction and fantastic maneuverability. Thanks to 3-wheel configuration and pivoting front wheel this stroller offers fantastic maneuverability. You will easily fit through narrow spaces. Steering and turning is very convenient, even when you use one hand. This stroller is literally made for parents who are often on the go with their babies! Folding is a piece of cake and the stroller fits in majority car trunks. Besides, the frame is made of a light aluminum, therefore the stroller is very easy to lift and carry. I have three children so I’m aware how much luggage you need to take (even for a day trip!). Thanks to enlarged basket and a few additional pockets, trips to the ZOO or museum with this stroller are much more easy and you are able to focus on having fun with kids. The stroller is equipped with reclining seat with near-flat position which is crucial for comfortable nap time. The seat has nice ventilation thanks to mesh window – bigger than the B-Agile had. There is also large canopy with UV 50+ protection. 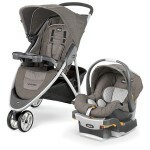 Britax B-Lively is just one part of this excellent travel system. The other part is B-Safe 35 Infant Car Seat which provides maximum safety for the baby during driving, strolling and traveling. B-Safe 35 was designed to absorb energy and protect the baby during a collision. This infant car seat has the shape of a shell. The seat is deep and the sides are curved which keeps the baby in stabile position and minimizes side-to-side movement. There is also a head insert for additional support. You can remove it as the baby gets bigger. This infant car seat has one more amazing feature which all parents will love: transition from the car to the stroller is a piece of cake and everything easily clicks in the right spot. 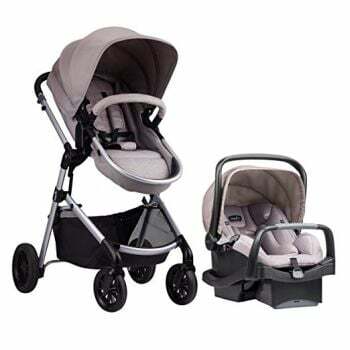 Currently this travel system comes in 3 different color versions which have different prices. Click here to check availability & compare prices. I always check what other parents say about the stroller I’m about to purchase. 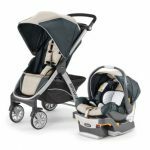 Britax B-Lively & B-Safe 35 Travel System is getting really popular at Amazon. What are the main assets and flaws according to other parents? B-Lively Travel system can be purchased with the B-Safe 35 Infant Car Seat, as well as with the B-Safe Ultra Infant Car Seat. The main difference between the two of them is that the latter one has not one, but two layers of Side Impact Protection. It’s also a bit more expensive. You can check B-Lively & B-Safe Ultra Travel System here. 1. Britax is a leader, when it comes to car seats safety. Thanks to B-Safe 35 you can be sure your baby is safe and secure during driving and strolling. Your child deserves this! 2. It has excellent price! You get a light and well-equipped stroller, fantastic infant car seat and a car base without spending a fortune. 3. Sometimes full-sized strollers are bulky and hard to push. With Britax B-Lively you can forget about this issue! It’s nimble, easy to navigate with one hand and maneuvers smoothly. If you’d like to compare this travel system with older version (B-Agile) here is my full review of Britax B-Agile Stroller and Travel System! 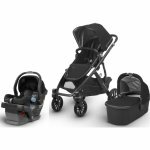 Chicco Bravo Trio is another example of the best travel system for 2019. Transitions to and from the stroller and the car are really quick and secure. And we don’t need any additional adapters for it! This stroller has many practical features like removable and adjustable canopy, adjustable handlebar, easy to use single-action brake, large basket under the seat. Chicco Bravo Trio is also very narrow and fits easily through tight spaces. The seat is removable, so you can snap the infant car seat onto the frame or onto the toddler seat, whatever is more convenient for you. You can also recline the seat by pushing one button. Chicco Bravo has foam-filled wheels which are fantastic for strolling around the city. There is also all-wheel suspension which absorbs shocks, so the child could enjoy smooth ride. This stroller has one more wonderful function. It features compact fold so it is perfect for parents who have small car or don’t have much space in their home. With such a small fold, this stroller is easily to storage and transport. What about the infant car seat? This travel system comes with KeyFit 30 which easily clicks onto the stroller and car base. Thanks to many safety qualities this is one of the best infant car seat in the US. It protects baby during a collision by absorbing energy. There is also convenient carry handle that has ergonomic design. Chicco Bravo Trio Travel System has over 250 positive reviews at Amazon at the time I’m writing this. WOW! This is remarkable score! Here are the main features that parents are satisfied with and few things that they don’t like. This Chicco travel system has quite small, plastic wheels which are better for even terrain than unbeaten roads. It’s design rather for city use. Also, it usually requires using two hands for steering. 1. By choosing Chicoo Bravo Trio with KeyFit 30 infant car seat you provide your baby with safe and comfortable ride in stroller and car. 2. Forget about heavy and cumbersome strollers! Chicco Bravo Trio stroller frame weighs only 17 lbs which makes it easy to carry and perfect for using as a car seat frame! 3. With this stroller you can save few bucks on a parent tray and cup holders, because they are included in the price! Want to find out more information about this stroller? You can read my full Chicco Bravo Trio Travel System review here! This is one of the best stroller/car seat combos in a medium price range. It comes with B-Safe Ultra infant car seat and B-Free stroller that will serve you well for a few years! This travel system includes a base for the infant car seat, but you can install it in a car without base – just with a seat belt. Britax B-Safe Ultra car seat is a good choice for parents who travel a lot or often use taxis. Nevertheless, it’s good to use the base when possible, as it is tested and proved for absorbing energy in case of a crash. There are also two layers of side impact protection. This means the force to the baby is reduced and your little baby is protected better. 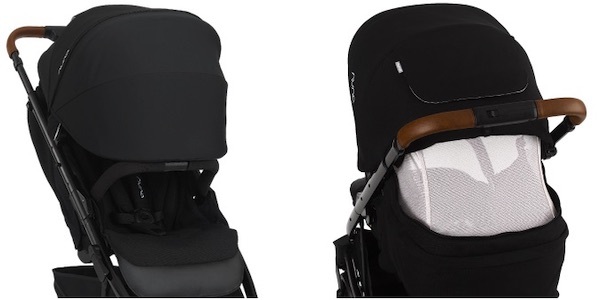 Foam-lined headrest provides extra support for baby’s neck and head. The pillow can be adjusted as the baby gets taller. I like the fact that B-Safe Ultra comes with no re-threading harness, therefore it’s very easily to adjust its height. This infant car seat is suitable from 4 to 35 lbs and 32″ (whatever comes first). B-Safe Ultra weighs 11.5 lbs, its base is additional 9 lbs. It is significantly heavier than Nuna Pipa Lite LX and Evenflo LiteMax models. Britax B-Free Travel System comes with adapters that easily snap right on the frame. 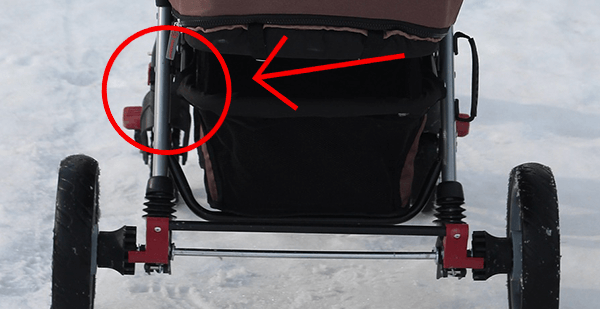 Without the adapters you can’t attach the infant car seat to the stroller, so it’s an additional thing that you have to do before placing it on the stroller. On a positive note, the receives are small and you can keep them in a storage basket or one of the convenient pockets and always have them at hand. Now let’s see what the other part of this travel system may offer you. In my opinion B-Free is Britax most versatile stroller in terms of suitability for different types of terrain. It has 3-wheel design which makes it really nimble and easy to maneuver with one hand. In contrast to B-Agile and B-Lively, it has single, not dual front wheel. Thanks to it, this stroller doesn’t get stuck on gravel. And you don’t have to worry about sand or debris getting stuck between the wheels. The tires are non-inflatable, but made of a rough and thick rubber. What’s noteworthy the tires are not completely smooth, they have some sort of a thread (in contrast to for example Evenflo Pivot Modular wheels), which provides better traction. LARGE canopy that provides excellent protection from harmful sun rays. Spacious basket underneath the seat plus SEVEN storage pockets – you won’t have to spend extra money on additional parent console. More information about B-Free in my full review. I did some online research about Britax B-Free Travel System to find out what parents like and what they complain about most often. B-Free Travel System is suitable for multiple types of terrain, but on very bumpy roads it’s not as smooth as strollers with air-filled tires. Although it has 3-wheel construction it’s not meant for jogging! 1. Roomy seat with high weight limit ensures long usability. This medium price travel system will serve you for years, even if your child is growing faster than their peers. 2. B-Safe Ultra is a remarkable infant car seat, suitable for traveling parents as it can be installed without the base. 3. This stroller offers tons of storage space. You will have enough room for all your stuff and you’ll be able to keep your essentials at hand. When I saw this stroller for the first time and didn’t know it’s name yet, I was pretty sure it is a new stroller from UPPAbaby. For me it looked so similar to my favorite VISTA and CRUZ. Then I saw it’s a travel system from Evenflo! I knew I had to try it, especially since the price was 3 times lower than VISTA’s price! Okay, price is not everything, let’s see what this travel system can offer us. It comes with Evenflo Rollover Tested SafeMax Infant Car Seat which is suitable from 4 to 35 lbs. Toddler seat can accommodate a child up to 50 lbs. This is a reversible seat which I really like because the child can ride and watch surroundings or look at the parent. The stroller is equipped with rubber tires. They work fine on flat surfaces like pavement and asphalt, as well as on indoor surfaces (at the mall or airport). What I also like about this travel system is the canopy which gives nice coverage. Therefore you can stroll during sunny or windy days and you can be sure your baby is well protected. This is a travel system so it should work perfectly during trip and be easy to transport. We use it when we were visiting my parents in North Carolina. It was easy to fold and didn’t took up so much space in our car trunk. The infant car seat is lightweight so we didn’t have any problems with carrying it. And transition from car to stroller took just few seconds as the installation onto the frame was really simple. Other noteworthy features of Evenflo Pivot Modular Travel System are: good-sized basket and parent cup holder. I also look up what other parents say about this travel system. Every time I check it at Amazon it has more and more review – it’s extremely popular. You can check on your own if there are any new reviews – click here and skip to Amazon. Here are main function that parents praise or complain about. This travel system is rather inexpensive and the wheels quality is not as high as on Vista, Tavo or B-Free. Sometimes they may lock and require using force to make the stroller rolling again. 1. Every mom knows how difficult the first months with the baby are. Treat yourself to a bit of comfort with this travel system! It’s super convenient to use and so comfy and safe for baby. Real lifesaver! 3. With this travel system you will save a lot of money! It’s top-quality and highly-rated, but costs less than $300! You can check the current price and discounts for Evenflo Pivot Modular Travel System here or read my in-depth review. This has been one of the best-selling travel systems and I’m sure it’ll still be very popular in 2019. 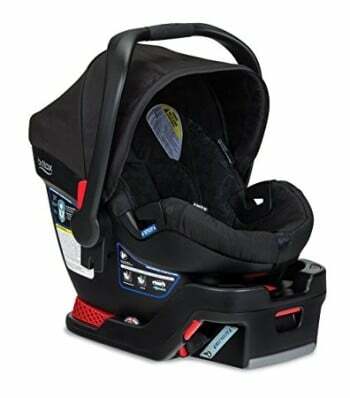 It comes with Graco Snug Ride Click Connect 35 Infant Car Seat which can hold an infant from 4 to 35 lbs and up to 32 inches. 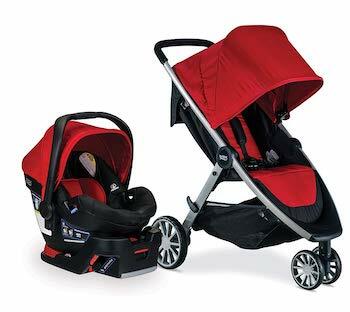 With this stroller/car seat combo you will have everything you may need when you are out and about with your child. You can quickly transfer your child from the car to the stroller because the infant car seat clicks onto the stroller seamlessly. No adapters needed! Keep in mind that stroller seat is not removable, so the infant car seat attaches onto it, making the stroller more heavy. It’s even suitable for light jogging! I can recommend it, especially for beginners. It won’t disappoint you on dirt roads, grass or snow either. This is one of the cheapest travel systems that include a jogging stroller. Although it has some flaws (like greater weight) it is a highly rated and very popular baby travel system. It can be a perfect option for parents who want a multi-functional stroller that can be used from birth, but also suitable for off-road strolls and light jogging. Keep in mind that with the infant car seat attached, you can only walk, not run. The canopy isn’t very big, but it does provide decent amount of shade. I like its side mesh windows that provide extra air-flow. This baby travel system stroller is heavier than other models in this ranking – it weighs 30 lbs, without the car seat attached. Taking it in and out of the car trunk frequently or carrying up and down the stairs may be challenging. It is also pretty big after folding and may not even fit in smaller car trunks. Some previous users complain about having to take off the wheels every time they want to squeeze this stroller into their car. The greater weight is a trade off for all-terrain wheels and solid, sturdy construction. Another advantage is the fact that parent tray and child tray are included in the price. There is also a fairly roomy storage basket underneath the seat where parents can fit at least medium size diaper bag. I also like that this travel system stroller has reflectors on wheels and child tray to keep you and your little rider more visible in low light. Not a bad equipment for such a cheap travel system! Last time I checked this it at Amazon it had few hundreds reviews and most of them were positive. Here are the things that parents like the most and few drawbacks they mention. Graco FastAction Fold Jogger Click Connect Baby Travel System is suitable for jogging, but only with a child who can sit on its own and keep their head up. Never jog with a baby in an infant car seat! 1. This travel system is inexpensive and you don’t have to pay extra for parent and child trays! It’s good choice for parents on a small budget. 2. Hundreds of parents admire the quality and durability of this travel system stroller. 3. It has additional safety features like a wrist strap and reflectors to keep you and your passenger visible and safe. 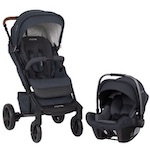 Another top travel system of 2019 which I can recommend is Chicco Viaro Travel System. It’s similar to the previously described Chicco Bravo Trio, however it has few different features and it is also cheaper. It has 3-wheel design with dual front wheel that provide better steering and easier turning. The wheels can handle gravel, paved roads and wooded trails. There is also front wheel suspension that helps to minimize the impact of bumps and cracks on the road. It has pretty big underseat basket which is easy accessible from the back and front. Chicco Viaro Travel System has even more accessories included: it comes with child and parent trays, each of them has two cup holders. Big plus! The stroller is very convenient to use with an infant car seat – The KeyFit 30, just like Chicco Bravo Trio. This infant car seat has adjustable straps which we can loose or tighten to provide comfortable ride for our little passenger. My boys used to love napping in this car seat! It is one of the best and safest infant car seats on the market. Although the main seat is not removable and the car seat snaps on the seat, the stroller itself is pretty light (weighs 18 lbs). Besides, it is very compact and easy to fold with one hand. And the last but not least, this travel system has really reasonable price! 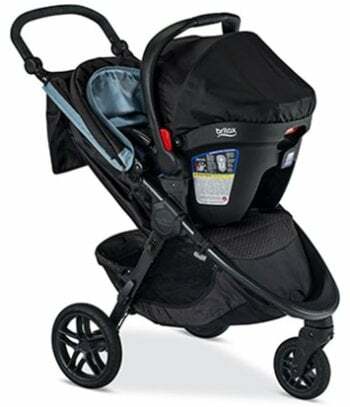 I checked Chicco Viaro Travel System at Amazon and I have to say parents love this stroller! Here are main pros and cons. Chicco Viaro doesn’t have a peek-a-boo window. Since the seat is not removable, the stroller with infant car seat attached may be quite heavy and big for some parents. 1. This travel system is super convenient to use. You can forget about struggling with folding. Here everything works like a dream. 2. You don’t want your baby to ride in poor-quality, untested infant car seat, right? Thanks to this travel system you can be sure your child gets one of the safest car seats available on the market! 3. Thanks to large basket under the seat, you will never lacked space for your baby’s gear and your shopping bags. Are you considering buying this travel system in 2019? Before you do that, be sure to check what other parents, who have this stroller, wrote about it at Amazon. This is another great travel system for 2019. 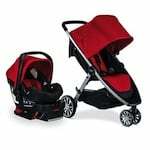 It includes upgraded Nuna Tavo stroller and amazingly lightweight Pipa Lite LX car seat. It’s a medium price range travel system but the top quality design guarantees that it’s a long-term investment. 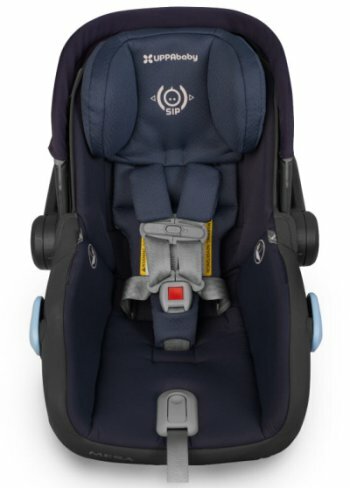 Nuna Pipa Lite LX is one of the safest and most innovative infant car seats. Its base and stability leg absorb impact in case of a crash and minimize force to baby. The base is required for installation in car – you can’t install the infant car seat with a seat belt. Therefore Pipa Lite LX is a good choice for parents who want to use car seat only in one car, and won’t be moving it frequently to another car. Nuna has used a patented foam called Aeroflex for Pipa Lite LX interior. Thanks to it the car seat is so lightweight, yet resilient. Besides, the foam minimizes the energy transferred to baby in case of a collision. Generous canopy with sun visor + Dream drape that fully shade the baby from sun and wind and allow for an undisturbed nap, without block the air-flow. Eco-friendly, soft and breathable fabrics – perfect for newborn’s delicate skin. They also help to regulate baby’s temperature and wick away moisture. Included ring adapter that allow you to attach the car seat onto the stroller frame within few seconds. Pipa Lite LX attaches to Tavo stroller without any adapters. It’s so convenient! Nuna praises Pipa Lite LX as one of the lightest infant car seats on the market. It weighs 5.7 lbs without the canopy and insert. The true weight of Nuna Pipa Lite LX with whole equipment is 7.1 lbs – which is still impressive and so easy to carry. With a baby growing up and gaining weight every day, this lightweight car seat is a game changer. Pipa Lite LX is just one part of this amazing travel system. The stroller that is included in the price also has a few features that make Nuna Tavo Travel System truly exceptional. 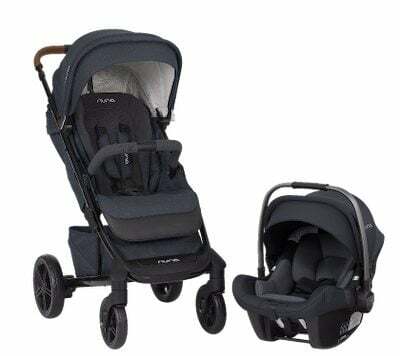 PRO TIP: It is cheaper to purchase this Nuna Tavo and Pipa Lite LX travel system, than to buy the stroller separately and add the car seat later. 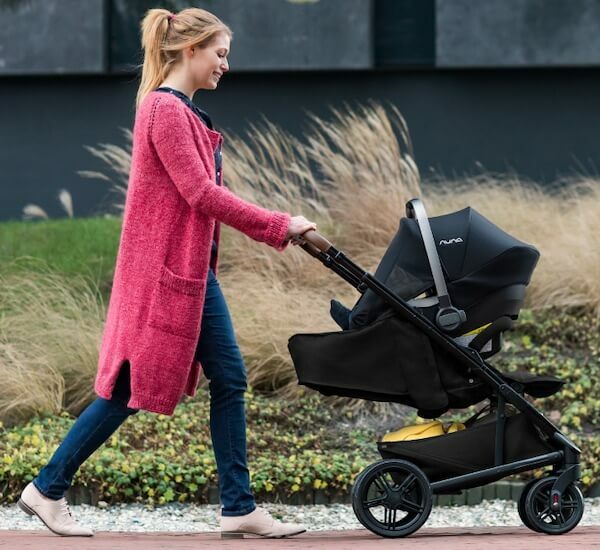 Tavo 2019 is the newest, recently upgraded version of the stroller. This travel system stroller comes with a newborn-ready seat that reclines with one hand to flat position. But what you will love most about the main seat is that it’s all-season. The backrest has two layers – one is made of breathable mesh No more worries about sweating and overheating during summer strolls. There’s also removable seat insert which provides additional support for baby’s body and head and keep the baby warm and cozy during chilly winter days! What makes Nuna Tavo one of the best travel systems 2019 is its maneuverability and ease of use. It doesn’t have all-terrain wheels like MIXX, but they will handle cracked sidewalks in your neighborhood. Of course they are not suitable for harsh terrain like tree roots or tall grass, but small bumps won’t be a problem. And thanks to progressive suspension the stroller won’t wobble that much. Another reason to go for this travel system stroller is its agility. It allows for one-hand steering and operates like a dream! And what’s important – you can fold it with just one hand! Nuna Tavo Travel System is available in two versions. One includes Pipa Lite LX car seat which comes with a Dream Drape and has more luxury fabric called TENCEL™. It’s a more expensive version (see exact price). The other one includes Pipa Lite car seat which is even lighter, but doesn’t have Dream Drape and the fabric is a micro-knit. This is a cheaper version. If you want to save a few dollars more, but still enjoy Nuna high quality, go for this Tavo + Pipa Lite travel system. 1. Your baby’s safety is the most important thing for you, right? With this travel system you can be sure your little one is secured and protected by one of the best infant car seats in the World! 2. All-season seat + bamboo insert are perfect for keeping baby from sweating during summer, as well as protecting from winter cold. 3. This stroller travel system offers flat recline so you won’t need separate bassinet for your newborn baby. However, there are several tricks to save some money. Buying a travel system might be the one way. Usually a set of matching stroller and car seat is cheaper than both products bought separately. Remember that high price doesn’t always guarantee high quality! Evenflo Vive Travel System costs around $150-$200! On the market there are a lot of cheap baby travel systems which are comfortable, reliable and made of good materials. We can find excellent travel systems under $200. One example of a awesome cheap baby travel system may be Evenflo Sibby Travel System that cost less than $200! You may ask if these cheap baby travel systems are worth buying. I can tell you from my own experience that many of budget travel systems have the same or very similar features like more expensive strollers. Of course you have to carefully check the functions, equipment, safety features and other important things when you choose a stroller. I hope my section on cheap travel systems for 2019 will help you to choose the right one for your baby. Stroller/car seat combo doesn’t have to be pricey. You can find great baby travel systems under $200. Sometimes they have less features, but in most cases they are as much high-quality as the high-end models. If you are planning to buy a stroller/ car seat combo for your newly born (or expected) babe, believe me, the Evenflo Sibby might be everything you need in one ultra-lightweight package. This travel system consists of the LiteMax car infant seat (4-35 lbs/ 30 inches) and a multi-featured stroller (up to 50 lbs/ 38 inches). Honestly, considering this travel system’s low price tag, one might not expect so much in regards to the quality of the infant’s car seat. But LiteMax is actually really nicely-crafted. It is a lightweight infant car seat with a good amount of padding, a removable head pillow, and a canopy for your child’s optimum comfort and support. Of course the car seat base is included too. Let’s now switch to the stroller. There are few things that I always check when searching for a good stroller.This cheap baby travel system seems to shine in most fronts although there are a few misses too. Similar to most seats, this one has a multiple recline positions that allow you to adjust its angle depending on whether the rider wants to view the world or take a nap. Another interesting feature here is a 3-position footrest that offers your passenger somewhere to rest their little feet rather than dangling them throughout the stroll. Big plus for Sibby for having this feature! The seat also has an extendable 3-panel canopy. The size is not that impressive, it’s just okay. On a positive note, the newest version of the stroller has a peek-a-boo window, which the old model lacked. Nice addition from Evenflo. The stroller has dual front wheels and slightly bigger rear wheels. Both the front and the rear wheels are made of plastic. Therefore you need to keep in mind that Sibby offer smoother rides only when used on flat surfaces such as in malls, park pavements and in cities. The wheels might get stuck when pushed over rough terrains. This affordable travel system of 2019 has yet another unique feature that most parent s can’t stop raving about: a standing board for older toddler (up to 50 lbs). One last thing that I have to mention – that makes it truly one of the best travel systems in 2019: lightweight design. The stroller itself weighs about 13 pounds! It’s so easy to operate and put away, especially for petite moms (and dads)! As always I checked other parents reviews of this travel system. What customers like and dislike the most? Never let a heavy child stand on the ride-on board or hang on the handlebars as the stroller can easily tip over. 1. It’s very affordable for what it offers – it’s one of the cheapest high-quality travel systems. Check the current price and available discounts at Amazon. 2. Ride-on board is very useful for older sibling. 3. If you are looking for a lightweight travel system, Evenflo Sibby may suit your needs. The stroller is easy to fold and carry. You won’t have any problems with it when you’re alone on a shopping escapade. 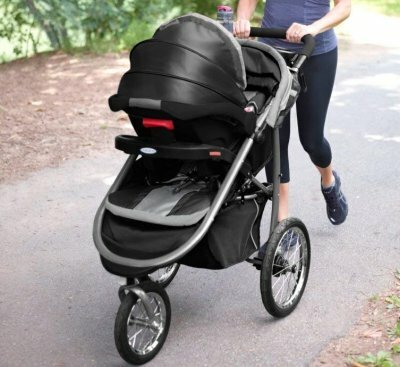 This stroller is a great example that not only standard strollers can be turned into travel systems, but also joggers can be used with infant car seat! If you are a jogging lover and want to use only one stroller from day one till toddlerhood for strolls and jogging – Baby Trend Expedition Travel System is an excellent solution for you! You can stroll with your newborn baby in an infant car seat attached into this stroller frame. When the baby is at least 6 months old and can sit up, you can use standard seat and start jogging. I like this travel system for great adjustable canopy, large basket underneath the seat, child and parent trays with cup holders included in the set. Besides, this jogger has swiveling lockable front wheel for better maneuverability and stability. It is easy to push literally with one finger and it glides smoothly, thanks to 3-wheel design and all-terrain tires. This travel system comes with Flex Lock 30 Infant Car Seat which features energy-absorbing foam for superior baby protection. There is a convenient handle so you can easily transport the baby between car, stroller and home. I like how quickly and easily we can click the infant car seat into the stroller and the base. At the time of writing this, I checked Baby Trend Expedition Travel System at Amazon and it had few hundreds reviews! This is incredible result. Table below presents main advantages and disadvantages. 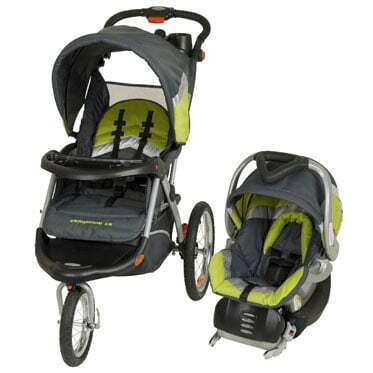 With newborn baby, remember to use this jogger with infant car seat, only for walking and choose rather smooth terrain. You can start jogging on tougher terrain when your baby can sit straight and keep his head up unassisted (around 5-8 months). This stroller has air-filled tires, so they require inflating every few weeks or months. 1. It gives you the flexibility of strolling and jogging on multiple types of terrain, thanks to large wheels and air-pumped tires. Your baby will have the smoothest ride ever! 2. This top-quality and durable travel system can be your only stroller for YEARS. 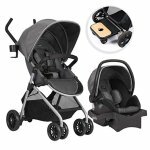 For less than $200 you get outstanding product with accessories included and you don’t have to waste money on another stroller. Here you can see the current price for this travel system. 3. Are you afraid that after birth you won’t have time to take care of your postpartum body? 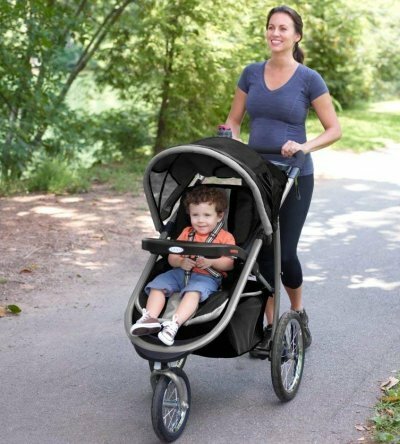 This wonderful jogger will help you get back into shape during pleasant stroll or run with the baby. This travel system includes rear-facing onBoard 35 LT infant car seat that simply and securely clicks into Safety 1st stroller. The set includes also car seat base. OnBoard 35 LT keeps your baby safe in case of an accident thanks to the Side Impact Protection. There is also an insert that keeps small newborn baby securely in place and supports their head and body. The main seat offers multi-position recline. It’s not fully flat therefore the stroller itself is not suitable from birth. You can use this travel system for your newborn baby only with the infant car seat attached to the stroller frame. The capacity of the toddler seat is 50 lbs. The stroller canopy is not huge, but it’s decent. It is equipped with a large mesh peek-a-boo window. It allows you to check on your baby, as well as provides better ventilation which is very important especially during summer. What I also like the most about Safety 1st Smooth Ride Travel System is its lightweight design – the stroller itself weighs about 18 pounds! This makes it very easy to carry and to load to the car trunk. The set includes a parent tray with a open storage for your smartphone and two cup holders. There is also a child tray that offers enough space for baby’s snack and sip cup. This is a big advantage that these extra items are included and the whole travel system is still really inexpensive! Safety 1st Smooth Ride Travel System has nice rating at Amazon and many positive reviews. Here are the biggest amenities and complaints according to parents. According to many users this travel system is good product for the price. It’s cheap so you should be aware it may have some drawbacks. But for less than $200 we can’t expect more. I think this travel system is good choice for parents on a tight budget, and for occasional, short walks. 1. This travel system is very lightweight so you won’t have any problems with handling it when you’re on your own. 2. It’s one of the cheapest travel systems that are worth considering. 3. There are few accessories for more convenient usage included with the stroller. You don’t have to buy any additional equipment, so you save money! If you are looking for a travel system under $100, unfortunately I have to disappoint you. In this price range you won’t find any good and reliable travel systems. Nevertheless, if you have limited budget you have two choices. You can find good stroller under $100 and buy compatible infant car seat separately. The other way is to choose good-quality travel system around $150-$200, which will provide comfortable and safe ride to your child. You can find such a travel system in previous section. If you still hesitate which travel system to choose for your little bundle of joy, here is my buying guide which may help you decide what model is right for you. Great thing about travel system is that you can use it since the birth till toddlerhood, so it can be your only stroller and you won’t have to waste money on another gear in the future. At the beginning you can use it as an infant car seat carrier. Thanks to it you don’t have to wake your baby sleeping in a car by putting to the bassinet – you just take the car seat out of the car and attach it into the stroller frame. Another advantage of travel system is the price. Buying a stroller and an infant car seat as a set will save you some money for sure! Besides, travel system allows to save space in the house. You just have to storage toddler stroller and infant car seat, there is no need to buy a second or third stroller that would take a lot of space. If you want to buy a long-lasting stroller with infant car seat, you’ve got two options. On the market there are many travel systems available as a matching set of a stroller and an infant car seat. In this case, you won’t need to buy additional adapters to install a car seat into the frame. However, there is also another option, for parents who want to buy a stroller that is not a travel system, but would work with infant car seat. Nowadays, most of the strollers are compatible with many car seat brands, you just need an adapter to install it. You can buy a standard, convertible stroller and simply turn it into a travel system! The second option is very popular recently. Mostly because it gives parents possibility of adding different car seat – you can choose the one you like and just buy a proper adapter for it. This option is also really useful, because in many cases travel systems have awesome stroller, but the infant car seats doesn’t meet parents needs. There are also many great joggers that are compatible with car seats and can be converted into a travel system – in this case you will also need to use special adapter. There are of course couple disadvantages. Sometimes this type of baby gear has less features than a stroller and an infant car seat bought separately. However, keep in mind that many modern strollers (and even joggers!) are compatible with popular car seat brands. So you can choose the stroller you really like, with functions you really need and then turn it into a travel system by choosing one of the car seats which is compatible with this stroller and also has the features you need. In my opinion, travel system works perfectly for running errands with baby. You don’t have to take the baby out of the car seat every time you stop by the store of coffee shop, because youcan stroll with a car seat. But I think prams are better solution for long walks as they provide flat position and perfect support for baby’s delicate back, neck and head. No matter what type of stroller you decide to buy, we you have to carefully choose the right model that will meet your expectations and provide comfy and safe ride for your little bundle of joy. When you choose the stroller with matching car seat or just picking the infant car seat compatible with your buggy, you need to carefully check its safety features. It’s very important because the infant car seat should provide the safest ride for your little one and protect him in the event of accident. The car seat should be rear facing and have stable base that will absorb the energy during a collision. There should be comfortable and easy to adjust harness and the whole seat should keep baby securely in place, minimizing moves from side to side. Also make sure the infant car seat is padded with soft material that won’t rub newborn’s delicate skin. The fabric should be breathable to prevent baby from sweating and overheating. Sunshade should go far down to protect baby from sun and wind and give him private space for naps. You can read more information about car seat features and regulations in the US here. When you buy a travel system for your newborn baby, you often focus mainly on the first months and pay attention primary to the quality of the car seat. But you can’t forget to make sure that the toddler seat, that you will be using in a six months, is also comfy, safe and reliable. The regular seat should be reclining, so the baby could comfortably nap during strolling. Another important feature is the five-point harness and padding. The ride should be not only safe, but also comfy for your little passenger. Canopy attached to the toddler seat should be big enough to provide great coverage for taller and bigger kid. It should be adjustable and have peek-a-boo window. If you want to use a stroller from day one till toddlerhood, you have to choose the one that has great suspension system and wheels big enough to provide smooth ride. It is very important especially during first months. You have to be sure that your newborn, sleeping in a car seat, won’t feel any shocks and bumps. If the ride won’t be cushioned enough it may have negative influence on baby’s spine and even lead to some diseases. The frame should be lightweight, but stable and strong at the same time. It’s pretty easy to stroll with a newborn in a car seat, but remember that a one-year-old in a toddler seat weighs much more. Be sure the travel system you choose is light not only with a car seat, but also with the regular seat. Here is my list of advantages and disadvantages of this type of strollers. Although travel systems are very practical and multi-functional, we have to keep in mind some drawbacks. Thanks to travel system transporting the baby is very easy. We don’t have to wake the baby up, take him/her out of the car seat and then put to the bassinet or normal seat. The only thing we need to do is to take the infant car seat out of the car and to install it to the stroller frame. It’s quick, easy and very convenient! Perfect for running errands with the baby. Great for parents who often drive before strolling and for parents who want to invest in one stroller that will serve them for 2-3 years. Usually travel system price is pocket-friendly. We can find some models even around $200 or $300. Buying stroller and car seat separately will definitely cost more than that. Sometimes the set doesn’t have so many features as stroller and car seat bought separately. If we buy travel system, it may turn out that infant car seat is great, but the toddler seat does not meet our expectation. I think sometimes it is better to invest a little more money in standard stroller with features we actually need and to buy separately infant car seat compatible with it. Car seats are not good for long strolls. Remember that during first months the best position for baby is fully flat. Nowadays travel system is one of the most popular type of strollers. It has many advantages that encourage parents to buy it. For example, they can serve as a primary stroller and you can use them from the birth till toddlerhood. You don’t need any other strollers, because right after the birth you can stroll with your baby in an infant car seat, and then switch it for standard toddler seat. It allows to spare some space in the house and save some money. There are a lot of awesome travel systems on the market today, not only standard strollers, but also joggers. If you consider buying travel system for your baby, don’t forget to check if both parts (infant car seat and toddler seat) have the features you need. I absolutely love these stroller system reviews! I am having a hard time choosing between the Nuna MIXX stroller and the TAVO. I mostly want to know what kind of terrain the TAVO can handle compared to the MIXX stroller. I see myself mostly walking pavement, city sidewalks, and fine park gravel. Probably special trips to the zoo and outdoor places once she is older, as well. Generally speaking Mixx wheels are slightly bigger than Tavo wheels, but what’s important they are more rugged and perform almost like pumped tires. It means that Mixx handles more types of terrain (for example trails or tall grass) and it doesn’t wobble that much on bumps. Nevertheless Tavo has impressive wheels too, as for an everyday stroller. And it’s perfect for city use, pavement, asphalt, flat gravel roads etc. It will go over grass as well. But you and the baby may feel bigger bumps for example on a gravel unbeaten road or super bumpy cobblestone, and cracks in sidewalks are slightly more noticeable. But I still think Tavo rolls really great, and much better than most of other standard strollers 🙂 If you don’t need an all-terrain stroller, Tavo is nice option! Hi, I was wondering if you could make a recommendation for me, I’m looking for a travel system with a small fold stroller as I have a mini Kia Soul and don’t have much space for a big stroller or space at home for one but would like to have one handy for walks. I couldn’t find dimensions of Kia Soul trunk, so below I include my list of travel systems that have compact fold and you just need to compare their dimensions with your car trunk. -Britax B-Lively with B-Safe Ultra car seat – Dimensions of the folded stroller are: 29″L x 23″W x 12″H. It’s quite lightweight (20 pounds) and it’s really easy to push and navigate even with one hand. Fold works smoothly and can be done with one hand. -UPPAbaby MINU with MESA infant car seat – Dimensions of the folded stroller: 11.5″L x 20.5″W x 23″H, weight: 14.8 lbs. It has small wheels, but for smooth ground they are perfect. Folding is pretty simple too and one-handed. This stroller is a good choice if you travel by car a lot, and if you’re not a fan of long strolls on rugged terrain. 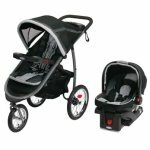 -Baby Jogger City Tour 2 with Baby Jogger City GO car seat – Dimensions of the folded stroller: 21.6″L x 17″W x 7″H, weight: about 14 lbs. It’s similar to MINU stroller – good for travel and smooth grounds like pavement, asphalt, even gravel. -Baby Jogger City Mini GT with City GO car seat – Dimensions of the stroller when folded: 29.53″ x 24.21″ x 10.24″, weight: 22.5 lbs. It has very roomy seat that can fit even a 4 year old kid, yet the fold is really compact and quick to do with one hand. The wheels are almost “all-terrain” and there is suspension that makes the ride really smooth. If you want a stroller that can handle grass, bumpy sidewalks, dirt roads, this one is a good choice. (If you still have some time I would recommend you waiting for the new version that should hit the stores this Spring – it will have self-standing fold and even better suspension). Hi! 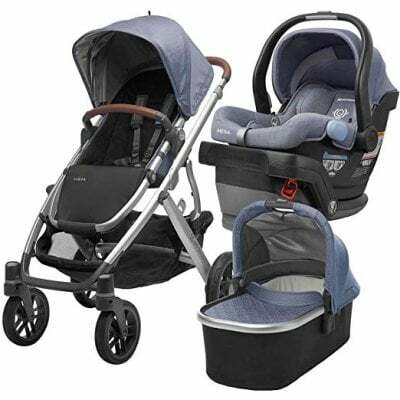 We are trying to decide between the Britax B-Lively and the B-Free travel systems. I know they are fairly similar so it’s been hard for us to really compare them, have any thoughts? B-Free is a bit more multi-functional and also slightly better equipped. -B-Free has enormous canopy which goes really really low. It extends further than the canopy on B-Lively. -B-Free has bigger storage basket and more pockets. -Tires on B-Free wheels are thick and imitate pumped tires a bit (but they are non-inflatable). B-Agile has really thin tires and they are suitable for more flat surfaces. B-Free can handle more terrains. These two strollers differ in weight and capacity too. B-Free weighs 22 lbs and can hold up to 65 lbs, while B-Lively weighs 20 lbs and has capacity of 55 lbs. The difference in weight is worth considering, if you are going to carry your stroller often. Other than that both strollers seem to be very similar, they offer deep recline and work with Britax infant car seats with included receivers. With attached car seat each stroller can be used right from birth. The main seat on each stroller is suitable for a baby with good neck control. I was planning to buy the nuna pipa infant car seat and match it with the nuna Tavo Stroller 2019. When I look at the reviews, this stroller looks a bit bulky, do you have any other suggestion for a compact stroller that is compatible with the nuna pipa infant car seat? Tavo is a full-sized stroller, it weighs about 24 lbs. I wouldn’t say it’s bulky, it’s rather standard 🙂 It feels really agile and easy to operate! I went through all lightweight strollers and here’s what I found. If you want something smaller and lighter then I can recommend you UPPAbaby MINU which weighs less than 15 lbs. There is a special adapter for Nuna car seats. But keep in mind that this stroller is not good for bumpy terrain, dirt roads etc, because it has small wheels. But on the other hand it’s very compact, both when open and folded. Very easy to store at home or to keep in the car. 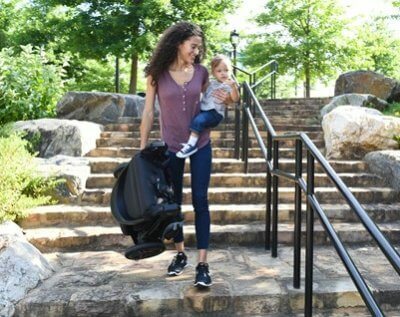 There are also two other strollers that you may want to consider – they have similar open dimensions as Nuna Tavo, but they are lighter: Britax B-Agile (18 lbs) and B-Free (22 lbs). The former one is a city stroller, the latter one handles more types of terrain and offers tons of storage space. Both these strollers offer smaller fold than Nuna Tavo. And for both you can purchase a special adapter for Pipa car seat. First time mom here due in May. I had my mind set on the Evenflo Pivot system because of the bassinet feature, the ability to use it from newborn to toddler and most importantly the price point. However, I’ve been seeing a lot of mixed reviews particularly issues with the car seat snapping into base & stroller frame and the wheels locking and/or seizing to work after 3 months of use. Do you think it’s worth risking the purchase? If not, are you aware of a comparable unit? Evenflo Pivot Modular is an inexpensive travel system – for less than $300 you get a stroller and a car seat so it’s not perfect and some parts like the wheels may feel a bit cheap. You need to be aware of that. I’ve heard a lot of complains about the wheels locking, but many parents say it’s something they can live with (sometimes you need to use your force to make the wheels rolling). The wheels are hard rubber, and they are not all-terrain, but they work well on smooth surfaces. So it really depends on what are your expectations and needs. Do you need an all-terrain stroller? Will you be strolling mainly on pavement or also on gravel, grass, snow? 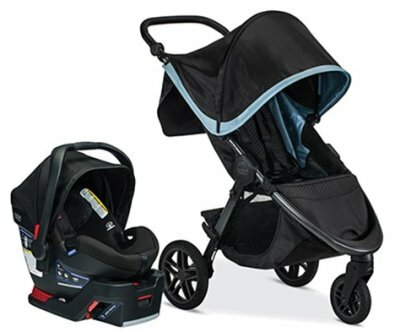 If you’re worrying about the wheels durability, but you don’t need an all-terrain stroller, you may want to consider Britax B-Agile which has similar price (maybe a bit higher). 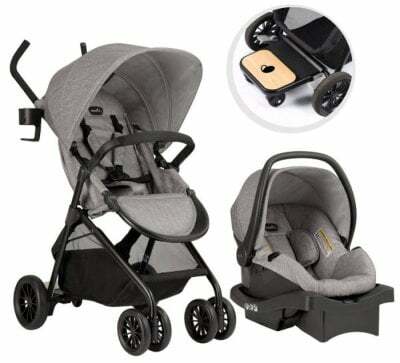 It’s a really good quality travel system, connecting the infant car seat with the stroller and the base is a breeze. This stroller is also made for smooth, even surfaces. If you need a stroller suitable for rougher surfaces I would recommend you going for something with better wheels like Britax B-Free, Baby Jogger City Mini GT (also available as a travel system) – if you have a bigger budget. Or Graco FastAction Fold Jogger Click Connect if you need something under $300. This one is suitable even for jogging, but you can also use it for walks on rugged terrain. Note that all of these travel systems are suitable for newborns – but only with the car seat attached to the stroller. Only the Evenflo Pivot has a seat that converts to a bassinet mode, other strollers don’t have this option. Hey there! Expecting a baby this spring and doing a ton of research, test driving is a bit overwhelming! Loving your reviews! I really want something light weight that I can handle when my husband isn’t around. I was trying out the baby jogger GT, the maxi cosi adorra, britax.. but then saw how light weight and easy the Chicco Bravo Mini Plus and it felt like a dream come true to go with our Keyfit! But upon reading reviews (and there’s not a ton I could find) everyone seems to dislike quality of the tires. 🙁 Can you please provide some insight this and if you think it’s even worth buying, or should I choose something else. Thank you! What are your thoughts on the Maxi-Cosi Zelia 5-in-1 Modular Travel System Stroller and Mico 30 Infant Car Seat Set? Love the car seat for the anti-rebound bar, cushy padding and the head and body pillow that supports small newborn baby. But I’m not a fan of the stroller. Wish it had better wheels at this price point! Thanks! What about the Nuna Tavo? As a firstborn time parent (to be), I found your article really thorough and helpful. Not due til July so have some time to decide but with so many varieties and options, I keep changing my mind on what seems like the best fit. Obviously love all of the features of UPPABaby Vista but probably need to stay at a lower price point. Just trying to figure out what features are critical and which aren’t as important (which I’m sure varies from family to family but some must be pretty crucial for all). Thanks! -How often and where you will use it – do you need a stroller only for daily use or also for off road? -How important for you is a compact fold? Would you mind having a stroller that weighs 25-27 pounds or would you prefer something around 20 lbs? In my opinion, Nuna Tavo is like a lighter city version of Nuna Mixx stroller. It has many great features, that Mixx has: flat recline + adjustable calf rest + removable infant insert (which create comfortable place for a nap, even for a small infant), LARGE canopy that provides shade for the baby even when the seat back is in lowest position (it’s a rare feature actually, with many strollers when the seat is reclined the canopy is too short to cover the baby). The back of the canopy opens and there is a mesh insert which is really nice for hot days. It has truly one-hand fold and pretty compact, flat fold. Possibility to close the stroller with one hand is especially important for example when you’re at the shopping mall and don’t have anyone to help you, and you have to quickly close the stroller. The storage basket is good size and can fit a diaper bag. I also like the telescoping handlebar – if you want to share your stroller with other caregivers who are shorter/ taller than you, it’s useful feature. One thing that you should keep in mind – wheels. They are different than for example Mixx or VISTA wheels, they are smaller and less rugged. This means Tavo handles rough terrain less impressive and on very bumpy terrain it may wobble a bit. Anyway, pushing Tavo is really comfortable and the stroller feels quite light and agile. Just remember it’s not all-terrain. Hi, thank you for this amazing review! I was originally planning on picking up the Graco Verb. How does it compare to some of these units? I’m finding it relatively difficult to find actual specs and details like the ones you’ve listed here on my own. It’s very convenient for everyday use – it weighs only 18.8 lbs. You can easily lift it to the car trunk or even carry up and down the stairs. Thanks to such a lightweight construction and carry strap it’s very portable. It can be used from day one if you convert it to a travel system with one of Graco Click Connect infant car seats which easily and securely attaches to the stroller. Keep in mind that other car seats are not compatible with this stroller! Main seat features multi-position recline – you just pull a strap and set the backrest at any position you want. This seat is suitable for baby who can seat unassisted and up to 50 lbs. I’m not a fan of the harness- it’s pretty difficult to use. Canopy is short, doesn’t cover the baby when you stroll facing the sun. There is a peek-a-boo window. Handlebar is rather for average in height and tall parents. I’m a petite woman and it was a bit too high for me. Front pivoting lockable wheels are 7″, while the rear ones are 8″. They are made of plastic so they are not suitable for rough surfaces or off-road strolling. They are designed mainly for flat terrain like concrete and asphalt. There is built-in suspension which cushions the ride a little bit, when you go over gravel paths. It has also decent storage basket – it’s not big, but adequate for such a compact stroller. You will be able to fit there smaller diaper bag. Great thing about this convertible stroller is that you can fold it with one hand, while holding your child in the other arm. Just push the button and it will collapse down. It also features very compact fold (dimensions: 18″ x 17″ x 11.65″) which makes it easy to store at home and it doesn’t take up the whole trunk. Unfortunately it doesn’t really stand up on its own. There is included parent tray with a storage compartment for phone or keys and two beverage holders and child tray with a place for snacks and two sippy cups or bottles of water. This tray is pivoting so you could easily take your baby in and out of the seat. When you consider its functionality and wheel construction it’s very similar to Britax B-Agile and Chicco strollers – designed for city use. 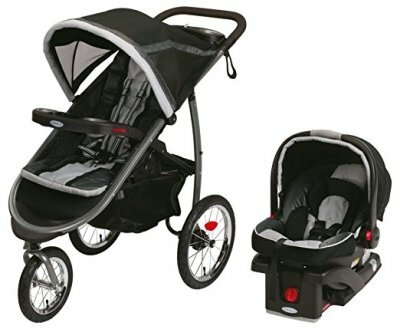 Hello, first time mom here, lots of information to take in when trying to decide on a travel system. I am deciding between the Chicco Viaro and the Evenflo Pivot. Live in the suburbs, so just sidewalks, parks, etc. Which would you recommend? Hi! 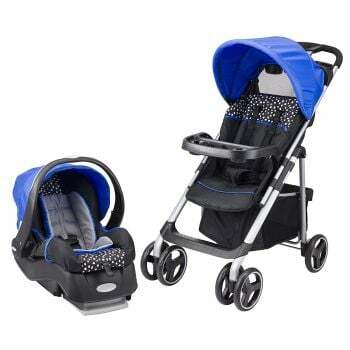 Both these strollers are best for smooth terrain as they have flat foam tires. So you do feel bumps more than on strollers with air-filled tires or forever-air rubberized tires (like on Baby Jogger City Mini GT). 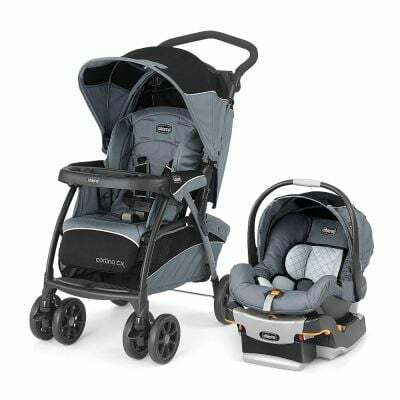 Considering these two strollers, I would go with Chicco as it comes with one of the best car seats in the US. 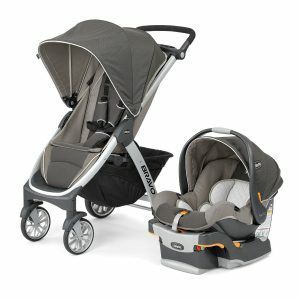 First time parent so feeling extremely overwhelmed with all the travel system options. Looking for something lightweight, smaller in size (I drive a 4-door Mini Cooper! ), easy to maneuver (with one hand would be great), versatile and of course safe! I certainly don’t want to sacrifice safety for all the convenience factors. At this point I’m torn between the Britax B-Agile (really for the safety factor), the Chicco Bravo Trio, Evenflo Pivot and an option I didn’t see in this review, the Graco Modes Click Connect. Any insight and guidance is greatly appreciated! I would recommend you to choose between Britax and Chicco travel systems. Graco Modes is quite big when folded (I’ve read a lot of customer reviews and parents say it takes up a lot of space – even the whole trunk of Toyota Corolla or Jeep Cherokee). 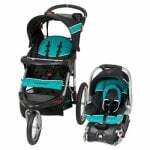 Britax B-Agile and Chicco Bravo have more compact fold, but you should compare their folded dimensions with your trunk to be sure these strollers would fit in it (B-Agile: 29″ x 23″ x 11″, Bravo: 16″ x 21.75″ x 28″). Both these travel systems come with fantastic infant car seats, probably the best ones in the US. 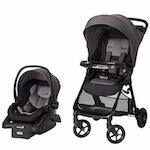 Here is my quick comparison of Britax and Chicco strollers. One-hand steering: When it comes to maneuverability B-Agile is definitely a winner. It is very nimble, easy to steer and turn with one hand. Tight places like shopping aisles or crowded sidewalks won’t be a problem for this stroller. Besides, it can handle many types of terrain (works best on flat surfaces but goes over gravel and thin grass as well!). Bravo is more difficult to push with one hand. It also goes through narrow places easily but it’s definitely more comfortable to steer with two hands. Versatility: Chicco Bravo has removable seat, so you can attach the infant car seat directly to the frame or you can install the car seat onto the regular seat. B-Agile travel system allows only for attaching the car seat onto the seat. Weight: B-Agile stroller is very light (and easy to carry) – it weighs only 18 lbs, while the Bravo stroller weighs about 22-23 lbs. Other features for convenience: Chicco Bravo has adjustable handlebar to minimize the wrist fatigue during pushing and it comes with parent and child tray. 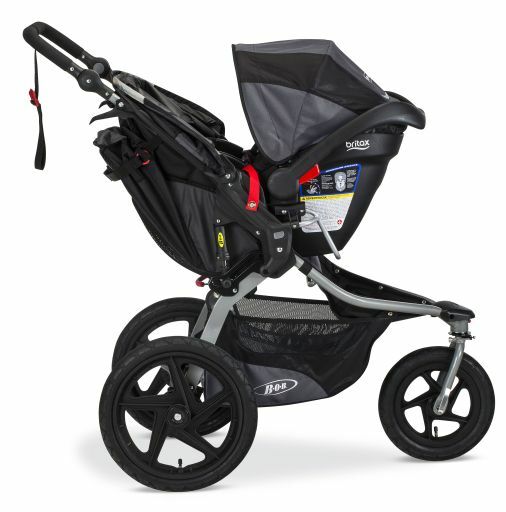 Britax B-Agile has non-adjustable handlebar and all accessories (like tray or organizer) are sold separately. You can find more information about these two travel systems in my full reviews: B-Agile is here and Bravo is here. Thank you so much! This is extremely helpful!! I am a short mom-to-be! Only 5’1”. Heavier car seats are hard for me too! But my husband is big and 6’2”…. which travel system do you think would fit us the best? We live in the suburbs! Lots of walking, trips to the park and stores. Thank you! -Graco SnugRide Click Connect 35 which weighs about 7.5 lbs and it is really highly rated by hundreds of parents (check it here). You can buy this Graco car seat with matching Graco Aire3 Click Connect Stroller which weighs only 22 lbs (number 6 in my ranking of travel systems). It would be a good choice for you, if you are planning to stroll mostly on flat terrain but I wouldn’t recommend this stroller for bumpy gravel. Unfortunately it doesn’t have adjustable handlebar. You have also one more option: if these strollers don’t meet your needs, you can purchase just one of the infant car seats and find a stroller that suits you better and offers an adapter that allow to attach the car seat. I had the Chicco for my last two babies, but I found it to be bulky and hard to maneuver. We travel often and are expecting our third baby. We are switching to the Britax for it weightlessness and no-base option for car seat installation. Great for ride sharing services. Hi Beth! Pivot Modular works awesome as an everyday city stroller, it will handle flat terrain or gravel in park. Some parents say it is pretty big, but I think it could work for you, since you want a seat for w newborn. Here the main seat converts to a bassinet and thanks to this 2-in-1 seat you don’t have an additional piece of baby gear to store. Usually everyday strollers don’t offer flat position and you need a bassinet or cocoon carrycot for newborn, but it takes extra space in home. In my full review of Pivot Modular you can check its dimensions (when open and folded), but I think it’s great that it features carriage mode without the need to buy bassinet. Hi Zooey, I’m thinking about buying Britax B-Agile travel system but I can’t decide which infant car seat to choose regular B-Safe 35 or Elite? I would go for B-Safe 35 Elite. In contrast to regular B-Safe 35 infant car seat, it has one additional safety feature – adjustable head protection which is an extra layer of side impact protection. Elite infant car seat has also no re-thread harness that can be adjusted as the baby grows. Besides, B-Agile Travel System with B-Safe 35 Elite is just a little more expensive than B-Agile with B-Safe 35, but more convenient and safe. Thanks for your comment. I’m glad my review helped you. Pivot Travel System is really great, I’m sure it will serve you well! Which is better Uppababy Vista or Britax B-agile? It really depends on your and your baby’s needs! Both strollers are very maneuverable, convenient to push and have comfortable seats. I would say VISTA handles bumps a little better. Besides, it expands to accommodate even three kids, so it is a great option if you plan to have more kids or already have an infant and a toddler! But VISTA is definitely more expensive than B-Agile, so it depends on your budget too. Let me know if you have more questions, take care!